Growing up, I went to a religious school. At graduation, the priest giving the commencement address said that we should always question our faith. Because if we do so and it causes us to lose our faith, then our faith wasn’t strong enough to begin with. And if we do so and we do not lose our faith, then it only makes our faith that much stronger. At the time, this idea blew my mind. It’s not that I’d always been told to blindly accept various things in life, but it’s the first time I remember someone in such an official capacity not just telling us that it’s okay to question and doubt, but that it’s a good thing. Since then, this fundamental idea has formed a core part of my identity. You do not convince people to your position on a matter by withholding the possibility of other options. You do so by facing challenges against your position head on. You need to lay out all the arguments — both the good and the bad — and explain why the bad shouldn’t matter. Knowledge is power. Information is power. And the easiest way to control a population is to limit its access to information. To take away their ability to form any opinion other than the one you want them to. Which is why book banning is so problematic. Books are how we create communities. They are how we step outside of our own identities and into those of others — they’re how we learn empathy. The only reason to ban a book is fear. Fear that once a book opens someone’s eyes, you will not be able to force them closed again. What makes this even more special and wonderful has been to share this entire experience with my co-author, JP. Apparently, I made a good choice to write with him since he is currently three for three on starred reviews!! Signing in Raleigh with Kami Garcia on October 3! Hey y’all! I’m super excited to announce that I’ll be joining Kami Garcia at Quail Ridge Books on October 3 to celebrate the release of the second book in her Legion Series: Unmarked! I’ve never done a signing at Qual Ridge and am so excited to finally get the opportunity! Plus, it’s Kami Garcia! She’s awesome! For more info, click here. Hope to see y’all there! What: I’ll be interviewing Kami Garcia about her latest release, answering questions, and signing! Hello all! There are a few odds and ends, events and whatnots, I wanted to give shout outs to! First, the fabulous and wonderful Margaret Stohl, author of the Icons series and co-author of Beautiful Creatures & Dangerous Creatures, will be signing with Brendan Reichs, co-author of the Virals series, at Park Road Books in Charlotte next week! The signing is at 4:30 on Wednesday, September 3d — I can’t wait to see y’all there! For more details, click here. Second, another fabulous and wonderful author, Beth Revis, just announced that she has a new book coming out and happily, the release is only a couple of month away! The Body Electric is a sci-fi Blade Runner meets Total Recall — I read a draft and couldn’t put it down! While you can pre-order the book everywhere, she’s doing a special, signed, limited edition through her local indie, Malaprops, which you can order through her website, here. Third, speaking of pre-orders and local indies, don’t forget that you can pre-order my next book, The Map to Everywhere, through my local indie, Park Road books! Not only will your book be signed (and personalized if you like! ), it will be shipped out to you with special goodies such as a poster of the cover, stickers, and a special letter. To order you can call (704-525-9239) email (orders@parkroadbooks.com) or buy through their website here (some folks have encountered an error page while checking out but Park Road says it’s just a glitch and to click through it). If you want Map personalized, don’t forget to leave a comment with the name you want the book made out to! Preamble: at ALA this year JP and I will be signing galleys of THE MAP TO EVERYWHERE in the Little, Brown Books for Young Readers booth (#422) on Sunday from 3-4! Come grab an ARC and say hi! More details here. 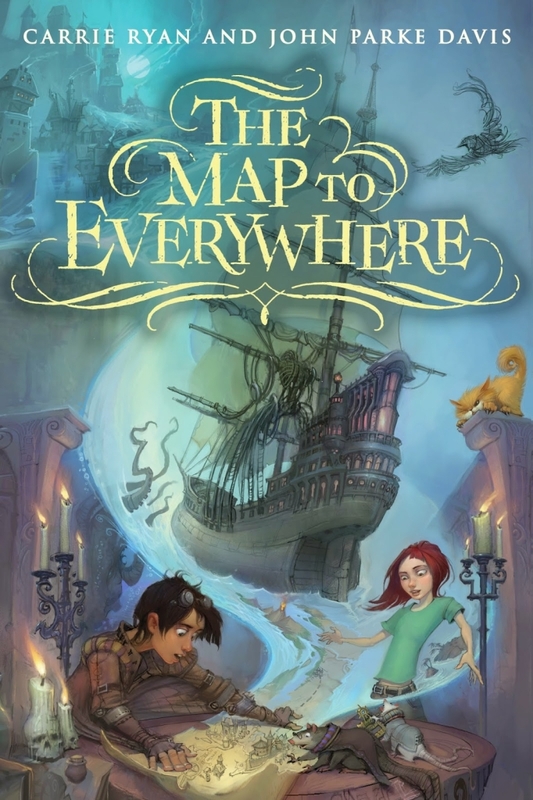 So I’m super excited that, thanks to the wonderful folks at Little, Brown Books for Young Readers, I get to return to ALA this year to promote THE MAP TO EVERYWHERE, the first book in the middle grade fantasy adventure series that my husband, JP, and I are writing. There are a few things that make this ALA feel even more special than usual. First, that JP will be there. He’s been hearing me rave about library conventions for years and now he gets to see it all first hand. Not only that, but he gets to experience it as a debut author (squee!!). 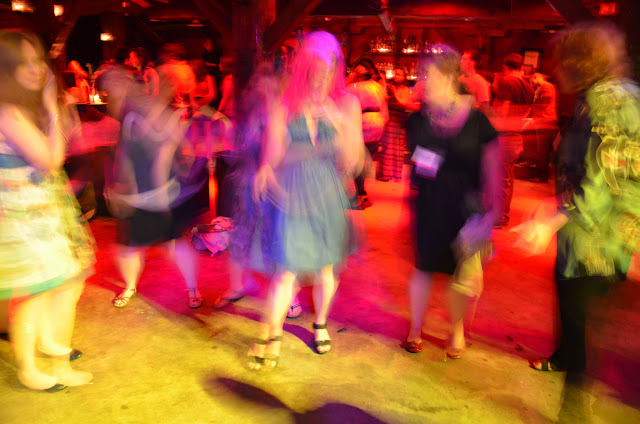 Me & Laini Taylor at the ALA 2011 LBYR party – hijinks! Second, the conference is in Vegas — which just in its own right means there are likely to be high-jinks and shenanigans. But the other connection is that in November 2012 my agent submitted The Map to Everywhere just before the NCTE (National Council of Teachers of English) convention… which also happened to be in Vegas. I was lucky enough to be there promoting Infinity Ring: Divide and Conquer. What I didn’t know at the time was that my future editor was also there, reading Map along with her co-workers and preparing an offer. So returning to Vegas to promote Map feels a bit like coming full circle! But more than anything, what has me excited (and, lets be honest, really really nervous) is that I get to get out there and talk to people about MAP for the first time. I know I haven’t said much about this book on the blog (I’ve become a bit superstitious about talking about books before they’re well and done), but I truly, truly love it. Of course I love all the books I’ve written in different ways, but I had the same kind of feeling writing MAP as I did writing The Forest of Hands and Teeth — that this book is special to my heart. Perhaps part of that feeling came from the fact that I wrote MAP with my husband. This is a book that we’d talked about for years, planning out worlds and story lines while taking long rambling walks with our dog. We didn’t yet have concrete plans to actually write it, but that didn’t matter because the joy was in the imagining of it. At the heart of MAP is our love of stories — our desire to write the kind of book we fell in love with as kids. Those are the books that sparked our imaginations — that taught us to daydream and think big. Those books are the reason we are where we are today: packing to head off to a convention with 20,000 other book lovers. I seriously have been dying to share this cover with the world for so long! And finally I can! Behold, the cover for The Map to Everywhere, the first book in the new fantasy adventure middle grade series I’m co-writing with my husband, John Parke Davis! There’s so much I love about this cover! On the left is Fin, a forgettable orphan from the magical Khaznot Quay and on the right is Marrill, a not-quite ordinary girl from Arizona. The orange, one-eyed cat getting ready to pounce is Marrill’s rescue cat, Karnelius, and those are two pirats (one has a sextant!!) in the lower right. I love how the map Fin is holding open morphs into the Pirate Stream itself with the ship (that would be the Enterprising Kraken, with an actual kraken preparing to attack!) sailing toward the Khaznot Quay. Todd Harris is the artist for this cover (you might recognize his work from The Hero’s Guide to Saving Your Kingdom) and there are so many details he managed to capture — little things that we hope the reader will flip back to as they’re reading and go “Oh! I see that now!” Todd has truly done an amazing job at conveying the spirit of this book and the entire series. When JP and I first saw the cover, we were both just completely blown away. With The Map to Everywhere, we set out to write the kind of book we’d have loved to read as kids, and this cover captures that in every way. We owe a huge thanks to Todd Harris and to the art department and our editors at Little, Brown Books for Young Readers who worked together to create such a perfect cover! Thank you! The Map to Everywhere will be out November 4, 2014 and you can click here to pre-order it from various places or here to find out how to pre-order an autographed copy (which will come with a free gift from JP and I). Anything you need–The Map to Everywhere can take you there. To Master Thief Fin, an orphan from the murky pirate world of the Khaznot Quay, the Map is the key to finding his mother. To suburban schoolgirl Marrill, it’s her only way home after getting stranded on the Pirate Stream, the magical waterway which connects every world in creation (Apparently she shouldn’t have climbed aboard the mysterious pirate ship that sailed out of nowhere and into a dry Arizona parking lot. How was she to know?). Pre-order Map and Get a Free Gift! We found out today that as a negotiating tactic, Amazon has removed the pre-order buttons for all Hachette books (including The Map to Everywhere which will be coming out from Little, Brown Books for Young Readers on November 4). While this is indeed unfortunate and, frankly, upsetting, I figure why not find the bright side to this situation? Because you know who you can still pre-order The Map to Everywhere from? Our incredibly supportive and wonderful local independent bookstore, Park Road Books. So JP and I have decided that if you pre-order a copy of Map from Park Road Books, we’ll not only sign and personalize it, we’ll throw in a free gift with purchase. To order from Park Road Books just give them a call, 704-525-9239, or shoot them an email orders@parkroadbooks.com! If you’d like your book personalized, don’t forget to tell them what name to use (and how to spell it if it has a unique spelling). Thanks for helping us support a store that’s supported us for so long!